The grant least privilege best practice advises you to grant only the permissions that are required to perform a task. To follow this best practice you should determine what your users need to do and then design IAM policies that let users perform only those tasks. AWS Service Catalog extends the very same best practice. If you are an administrator, it lets you specify the AWS CloudFormation template that your users can launch, while restricting the permissions required to create individual services. If you are an end user of the AWS Service Catalog, you don’t need to worry whether you have enough permissions to launch the stack or whether you are following your organization’s tagging strategy correctly. In the first part of this two-part series of blog posts, I explain how you can manage the AWS resources your users can create using AWS Service Catalog. In the second blog post, I show how you can use AWS Lambda to decommission all of the resources that have been provisioned from an AWS Service Catalog portfolio. A product is an IT service that you want to make available for deployment on AWS. You create a product by importing a CloudFormation template. A provisioned product is a CloudFormation stack. When an end user launches a product, the AWS Service Catalog provisions the product in form of a CloudFormation stack. A portfolio is a collection of products, together with the configuration information. You can use portfolios to manage the user access to specific products. Constraints control the way users can deploy a product. With launch constraints, you can specify a role that the AWS Service Catalog can assume to launch a product from the portfolio. Launching a high-end EC2 instance. Launching an EC2 instance with a wide-open security group. The user might never tag any of the resources they created leaving you a number of unknown resources to manually discover and clean-up after the training. A simple solution to mitigate these problems is not to give CloudFormation template creation access to the IAM users. Instead, you will use AWS Service Catalog to manage the resource provisioning. Then, upload WordPress product to the portfolio created. The product contains the WordPress CloudFormation template and configuration information. Next, create an AWS Service Catalog IAM role (role) and associate it with the WordPress product, as a launch constraint. Later, when users provision the product, AWS Service Catalog will assume the role created. Next, grant the training attendees access to the portfolio that you created. Then verify whether training users can provision the product. During the training, users can use the AWS Service Catalog to provision the WordPress product. After the training is over, you terminate all provisioned products from the portfolio. 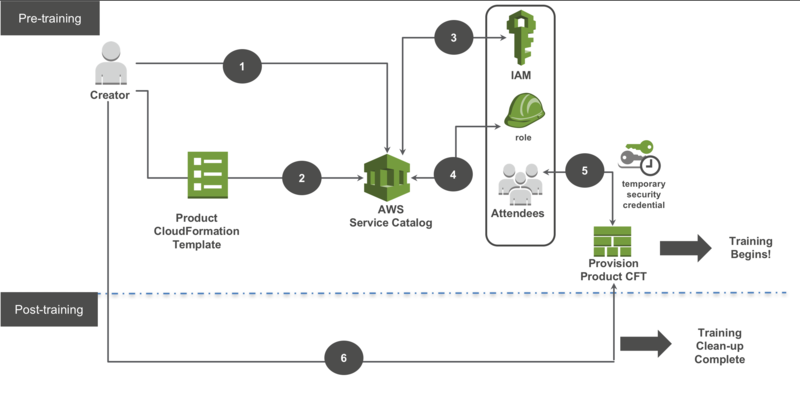 The following solution diagram illustrates how you can set up a training using AWS Service Catalog. Create an IAM user group for the training attendees. To do so, create one or more IAM users (for distributing to training attendees) in your AWS account and assign no permissions to them. Next, create an IAM User Group with a group name as Training-Users and then add IAM users created to the Training-Users group. Verify that AWS Service Catalog is supported in the AWS Region. AWS Service Catalog Administrator access. IAM Permissions to create a new IAM role. Then, you need to create an AWS Service Catalog portfolio. You will use the portfolio to provide training attendees an access to the WordPress product. Sign in to the AWS Management Console and then open https://console.aws.amazon.com/servicecatalog/. If you are using the AWS Service Catalog administrator console for the first time, choose Get started to start the wizard for configuring a portfolio. Otherwise, choose Create portfolio. Description – Portfolio for conducting a WordPress training. From the Service Catalog drop-down menu, choose TagOption library. Specify key as Portfolio-Name, value as Training Portfolio, choose Save. From the Service Catalog drop-down menu, choose Portfolios list. Select Training Portfolio, expand TagOptions, choose Add TagOption. Select the entry with the key as Portfolio-Name, value as Training Portfolio, choose Save. Next, you need to upload the WordPress product to the portfolio created. Click on Training Portfolio to open the portfolio details page, and then choose Upload new product. Description – This product launches WordPress CloudFormation Stack. On the Enter support details page, choose Next. On the Review page, choose Create. Next, you’ll create an IAM role that AWS Service Catalog can assume to allow training attendees to launch a product. Provide a name, such as WordPressPolicy, choose Create Policy. Choose AWS service and then choose Service Catalog. Next, choose Next: Permissions. In Filter panel, type WordPressPolicy. Select the check box for the WordPressPolicy policy, and then choose Next: Review. For Role name, type WordPressServiceCatalogLaunchRole. In the filter panel, type WordPressServiceCatalogLaunchRole. Click on the result with WordPressServiceCatalogLaunchRole as the role name. Note the Role ARN displayed on the summary page. Open the AWS Service Catalog console at https://console.aws.amazon.com/servicecatalog/. On the portfolio details page, expand the Constraints section, and then choose Add constraints. For Product, choose WordPress, and for Constraint type, choose Launch. Next, choose Continue. On the Launch constraint page, for Enter role arn, type the role ARN your noted earlier, and then choose Submit. Next, you need to allow the Training-Users IAM Group to provision a product. In the filter panel, type Training-Users, the search result will display a single result, Choose the result. In the summary page, choose permissions tab. Expand inline policies. Console will display a message stating there are no inline policies associated. Choose click here. Choose Custom Policy, then Select. For Policy Name, type SCProvisionProductAccess. On the Summary page, Permissions tab, Managed Policies section, choose Attach Policy. In the Filter panel, type ServiceCatalogEndUserAccess, the search result will display a single result, choose the result. Open https://console.aws.amazon.com/servicecatalog/ and choose the Training Portfolio. On the portfolio details page, expand the Users, groups and roles section. Choose Add user, group or role. On the Groups tab, select the check box for Training-Users. Before you give the account credentials to training attendees, verify whether training users can provision the product. The WordPress template requires you to have at least one EC2 key pair present in your selected AWS Region. For more information about how to create a key pair, see Creating a Key Pair Using Amazon EC2. Sign in to the AWS Management Console with the credentials of any IAM user you added to the Training-Users IAM group. Next, open the AWS Service Catalog console at https://console.aws.amazon.com/servicecatalog/. In the Products section of the console, choose WordPress and then choose Launch product. On the Product version page, for Name, type WordPress. KeyName – Select the KeyName you have access to. SSHlocation – Type a valid CIDR range for the IP address from which you will connect to the instance. This can be the default value (0.0.0.0/0) to allow access from any IP address, your IP address followed by /32 to restrict access to your IP address only, or something in between. DBPassword, DBUser, DBRootPassword – Provide alphanumeric characters of your choice. On the TagOptions page, choose Next. On the Notifications page, choose Next. On the Review page, review the information that you typed, and then choose Launch to launch the stack. The initial status of the product is shown as Under Change. After the product is launched, the status becomes Available. Your environment is ready. You can now distribute the user credentials that you created in step 1 to all training attendees. Attendees will be able to provision the WordPress website using the AWS Service Catalog console, but they will not be able launch an EC2 instance or execute any other CloudFormation template from the AWS Management Console. After the training is over, you can easily clean up all resources created by attendees. To see how you can clean up all products attendees provisioned during the training, see Part 2 of this series of blog posts. This blog-post is Part one of a two-part series of blog posts. In Part one I show you how you can use AWS Service Catalog to allow users to launch CloudFormation stacks in your environment, in a controlled manner. AWS Service Catalog also allows you to define template constraints if you have a requirement of allowing users to specify only certain CloudFormation input parameters. To see how you can clean up all products provisioned during the training, using AWS Lambda, see Part two of this two-part series of blog posts. If you have questions about implementing the solution described in this post, start a new thread on the AWS Service Catalog Forum or contact AWS Support. Kanchan Waikar is an AWS Marketplace Solutions Architect at Amazon Web Services. She enjoys helping customers build architectures using AWS, AWS Marketplace products, and AWS Service Catalog.